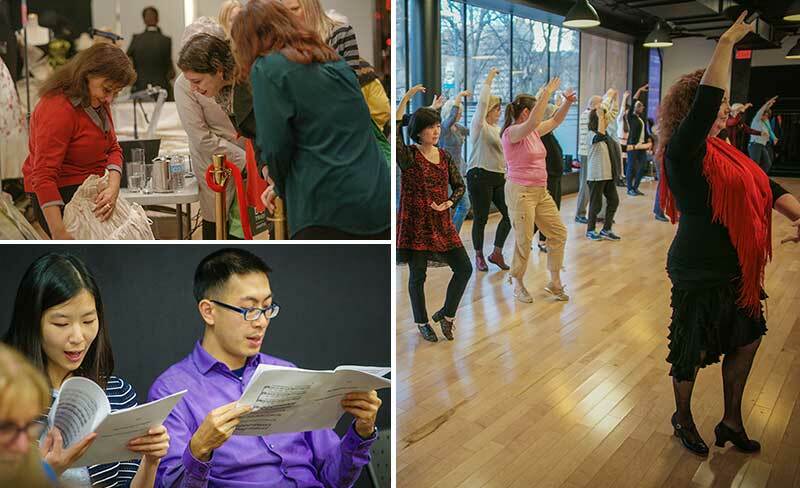 Join us for in-depth conversations and interactive workshops that take you inside the COC's 2018/2019 season! All events are FREE but require a ticket. Register online or call COC Ticket Services at 416-363-8231 to reserve your spot. It is our policy to overbook. In the event of reaching full capacity, your reservation may not guarantee admission. Unclaimed reservations will be released to a standby line 10 minutes prior to the start of the program. We recommend that you arrive at least 20 minutes before the event start time. Tickets for Spring 2019 events will be available on Monday, March 25 at 10 a.m.
Monday, April 8, 7 – 8:30 p.m. Warm up those vocal cords for the fourth annual opera sing-along! With the help of Price Family Chorus Master Sandra Horst, we’ll learn some of opera’s most loved choruses and perform them together from start to finish. No musical experience necessary. Tuesday, April 16, 7 – 8:30 p.m. Ever wondered how the opera singers do it? For any given performance, they’re singing, they’re acting, they’re working closely with the conductor, and – oh, yes – they’re often doing it all in another language. This casual 90-minute performance and discussion brings you inside the world of COC opera singers in training as they prepare to perform the rich and romantic crowd favourite, La Bohème. From learning their parts, to rehearsals, staging, and performance, Ensemble Studio artists explain their creative process and perform selections from the nostalgic tale of bohemian Parisian life. Thursday, April 25, 7 – 8:30 p.m.
You might already know the Shakespeare play. Now, learn how it gets the full opera treatment in Verdi’s Otello. Join musicologist Matthew Timmermans as he guides you through the musical score and a variety of interpretations. Discover how Verdi sets the mood with trembling strings and bombastic brass and hear how the greatest singers put their personal stamp on these roles. No music reading experience necessary. May 12 at 7-8:30 p.m. Explore the story of Othello as it is understood through Shakespeare’s Othello and Verdi’s opera Otello. By focusing on the theme of jealousy, we investigate how Shakespeare, Verdi and the artists performing each work employ the tools of their respective art forms to create such compelling and penetrating expressions of human character. What symbols and devices are used to communicate the idea of jealousy? How do soliloquies and arias compare as expressive forms? What unique qualities of theatre and opera lend themselves to these grand narratives? Tickets can be reserved by phone (416-363-8231) or online. Reservations will open on September 12, 2018 for the fall 2018 events. I’ve reserved my ticket. When should I arrive? Doors open 30 minutes before the beginning of the event. We suggest you arrive 15-20 minutes early so you can get a seat! All unclaimed seats will be distributed to a stand-by line 10 minutes before the event begins. What happens if tickets are sold out? Don’t worry! Just show up at the Opera Insights event early and join the stand-by line. 10 minutes before the beginning of the event, all unclaimed seats will be distributed on a first-come, first-seated basis. Do I have to reserve a ticket? Can I just show up? Either! But reserving your free ticket is the most convenient way as it allows you to skip the stand-by line and go right in 30 minutes before the show. In either instance, remember to arrive early, as these events fill up quickly and all unclaimed seats will be released to the stand-by line 10 minutes before the event begins. All Opera Insights events during the 2018/2019 season are free. Do I need to know about opera to attend this event? No! All are welcome to Opera insights events. Whether this is your first or hundredth time to the opera house, this is for you. Every event is different, but they generally run 60-90 minutes. Where are Opera Insights held? Is it accessible? Most Opera Insights events happen in the Four Seasons Centre, at the intersection of Queen/University Ave. (Osgoode TTC station) in either the Education Center located to the left of the box office at the exit of the Osgoode subway station, or in the Richard Bradshaw Amphitheatre located on the 3rd floor. Both spaces are wheelchair accessible, and seating is reserved for any patrons who require special accommodations. During the 2018/2019 season, both conferences will take place outside of the Four Seasons. Both locations are wheelchair accessible. Please reference the address located on the event listing for more information. I need special accommodation to attend this event, who can I contact to make sure my needs are met? Please contact the Box Office or [email protected] with your name, the date of the opera insights event you would like to attend, and the type of accommodation you require. We will make every attempt to meet your needs. Both the Richard Bradshaw Amphitheatre and the Education Centre are wheelchair accessible with adjustable seating. Seats are reserved at the front for those requiring special accommodation. I have an idea for an Opera Insights event, who can I contact? Under 30? Get your $22 tickets now! Explore this season's electrifying mainstage operas.